In the first series of blog post we have seen how to create a pelican blog, customize a little and also host it from Github pages. 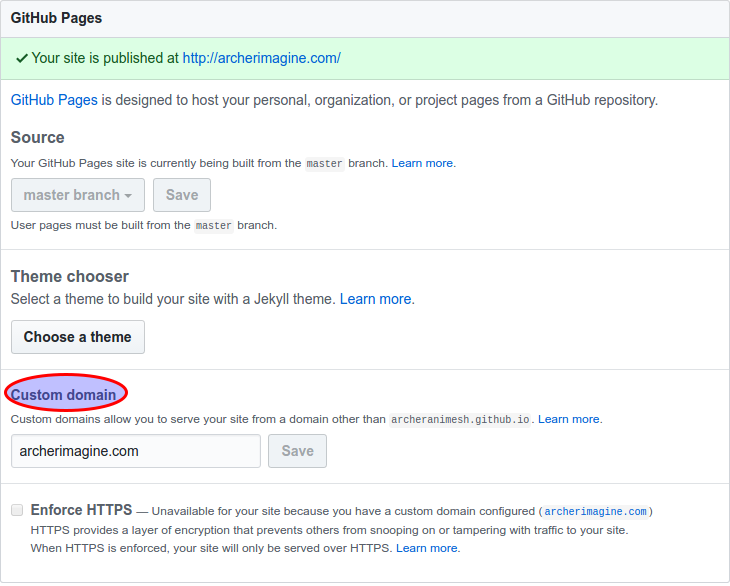 We can also use Github pages as a hosting service and link any of the domain name providers with this hosting. In this post I have taken the example of GoDaddy, but the process should not much different for any other domain name provider. The process to link a Godaddy Domain to Github Pages can be divided into 2 Steps. We have already made a Github Pages website in our previous post, kindly follow the steps mentioned here. Once we have a Github Pages URL, we have to configure a CNAME in this repository, this can be done in 2 ways. Create a local file in the repository with the name CNAME. Just have one line in the file. example.com, where example.com is your domain you have bought from GoDaddy. On the repository in Github, you will see something like this. In the above Click on the Settings, Scroll down you will see something like this. Enter the domain you have purchased from GoDaddy. These are the only changes required to be done in GitHub. The easiest of the all the below references is Configuring a Godaddy domain name with github pages. The real issue in all the links is that it shows the old UI of GoDaddy, so some things get confusing. Go to the account setting page, which mostly will like in this link. The link will look like this. From the above option we have to add 3 entries. This is how all the 3 would look like after adding. Now you can launch and check your desired domain. Kindly wait 48 hrs for these changes to reflect, do not try to configure multiple times, if it does not work even after 48 hours kindly search for help, till then take a coffee break and have a nice time out of this screen. When we are doing the above process, even after 24 hours, when you launch your website, we find one of these errors. It is detected as a Malware in the office network. The website might launch for some times and sometimes you might get any one of the above 2 errors. Kindly check this in the Manage DNS page. We had added two A Names pointing to the GitHub URL as shown below. [Help]: How to correctly connect my github pages blog to a custom domain? Kindly read the above site, to understand what is the use of CNAME and A Record. Great introduction.